Anybody Repopping '59 Headlight Wiring? Anybody know if anyone is reproducing the headlight wires for the '59 style headlights. These are the round back, not teardrop, Guide lights with the sealed beam. 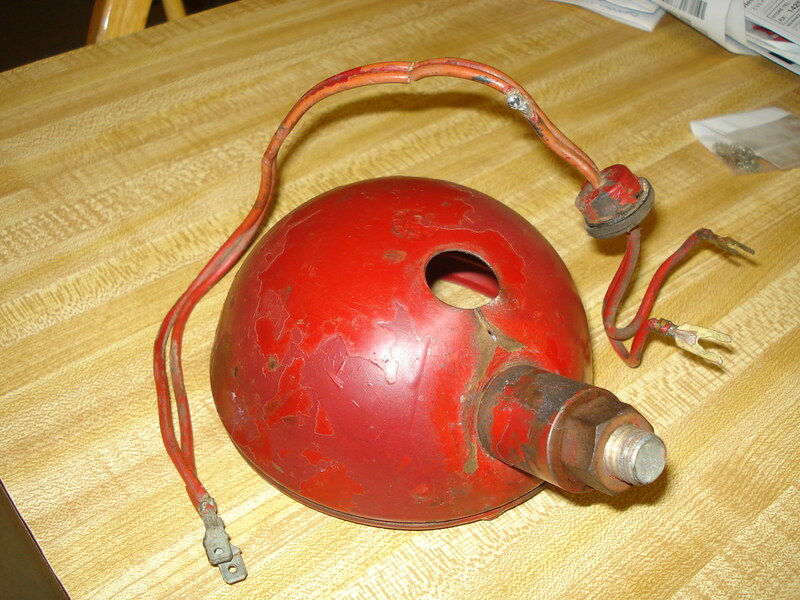 The wiring is two conductors molded together, red in color with spades on the tractor end and "U" shaped crimped on connectors on the bulb end. The wires go thru a grommet that sticks out the back of the light body.....in other words these aren't the type with the black plastic round part that sticks out the back that a screw terminal attaches to. These have the wires go from bulb, thru the grommet in the lamp body about a foot after the grommet and then terminate in spades. I can't find a suitable grommet (it's more like a rubber cork with a tiny hole in the middle than a grommet) or even twin conductor (16 or 18 ga) wire in red that is molded together like speaker wire, only single conductor in red or twin conductor in black or red/black. I'm sure I could track down the spades and "U" shaped connectors.......but was hoping someone already sold this as a pre-made assembly. I can post a pic later if no one knows what I'm talking about. I tried all the usual vendor suspects and haven't found anything. Seems like the other styles of headlights are fully supported, but not this style, other than bezels and bulbs. Also looked online for Guide light parts in general and came up empty. I forget now if '59 was the first year of this style light or the last........but there must be a ton of Cubs that had them, so I'm not sure why no one is reproducing them. If anyone knows of anyone who makes up these wire assemblies........or where they are being sold........can you please let me know? Re: Anybody Repopping '59 Headlight Wiring? I was about to start the same search. It was used from '58 through the last 6-volt tractors, 1964. TM has headlights that are similar with two wires w/brown wire and black grommets. Just got off the phone with Porch Electric in Illinois and they said they can make these pigtails for your headlights with red wire and grommets. Contact them directly. Ask for Janet. Bob, That picture you have would be great to send to Porch Electric for accuracy in getting the correct ends put on the wires and the correct grommet. There is a similar 3-wire harness for the rear combo-light. I would like to find one of them too. Yes, I've got the three wire rear light too. I can send them both to Porch if they need them for patterns. But I see they list both a "headlight wire assembly" and a "rear light wire assembly" for '59 to '64 Cubs in their catalog.......so maybe they already make these harnesses. I'll call tomorrow and find out and let you guys know. Yes, the part numbers for those harnesses are what Porch lists in their catalog......so they do make these harnesses. Looks like Precision Tractor also sells the same 2 harnesses as Porch for the front and rear lights, at the same price (within a buck or two). Thanks for doing some more legwork w30bob. Looks like we have found them. Hope this helps all who are looking for them. They are pet of the Brillman Harness for your cub. I bet if you call and ask they will sell you that part. The grommets look different than the factory style grommets on mine. Cubfriend wrote: Just got off the phone with Porch Electric in Illinois and they said they can make these pigtails for your headlights with red wire and grommets. Contact them directly. Ask for Janet. I called Porch on Thursday and spoke to Gloria about these two harnesses. Seems there`s some issue with the part numbers they gave listed. Long story short I need to send Porch pics of both the front and rear light harnesses so they can figure out what`s what. I'll do that tonight or tomorrow. I think Precision Tractor has the correct PN's for the harnesses in question, but they are not the same numbers Porch has listed, and Gloria confirmed their numbers aren't correct. Will get to the bottom of it and let you know.